From The Female Family Of: BHF Carol Trigg which includes WC sire WC Chief of Greystone, BHF Northern Empress, WC Delightful Time, WC CH Super Serenade, BHF Lady Trigg, WGC CH Imperiaptor, WGC sire Longview's Paladin, WC Main Title, WC CH Rebel Command, BHF Lady Trigg, WGC CH Boucheron, WC CH Sergeant Royalty and many more! 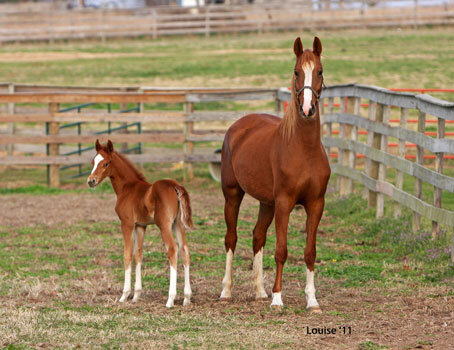 2012 Winsdown Lady Edith- (Chestnut Filly by Winsdown Westinghouse)- 2012 Denver Queen City CO Futurity Weanling Champion. 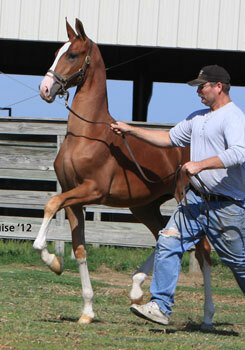 2012 Missouri State Fair MO Futurity W. Filly Reserve Champion. 2012 Salina Charity Futurity Weanling Reserve Grand Champion and Amateur Weanling Champion. Champagne Dancer (11 SBR points) by RWGC sire Champagne Fizz- 1994 River Ridge Junior 5 Gaited Champion. 1996 J D Massey 5 Gaited Amateur Grand Champion . 1997 Pro Am 5 Gaited Amateur Champion. 1999 Des Moines Springfest 5 Gaited Grand Champion. 2000 Mid-America Signature 5 Gaited Grand Champion. RWC Radiant Event (14 SBR Points)- 1997 Blue Gray Shrine WV LTD Stale Champion. 2002 Bonnie Blue 3 Gaited Show Pleasure Jr. Ex. Grand Champion. 2002 ASHAV 3 Gaited Show Pleasure Jr. Ex. 14-17 Grand Champion. 2003 KSF RWC 3 Gaited Show Pleasure Adult 18-29. 2004 KSF RWC 3 Gaited Show Pleasure Adult 18-29. 2005 Roanoke 3 Gaited Adult 18-40 Grand Champion. 2006 Dixie Cup Park Pleasure Amateur Grand Champion. 2007 Dixie Cup Park Pleasure Grand Champion. 2007 Southeastern Show Pleasure Driving Reserve Grand Champion. RWC Explosive Material (10 SBR Points)- 2000 Blue Grey Shrine WV LTD Stake Champion 2001 KSF RWC Futuirty Amateur Yearling. 2007 Santa Barbara 3 Gaited Show Pleasure Jr. Ex. Grand Champion. 2007 California Futurity 3 Gaited Show Pleasure Jr. Ex. Grand Champion. 2007 Arizona Futuirty 3 Gaited Show Pleasure Jr. Ex. Grand Champion. 2008 Carousel 3 Gaited Jr. Ex. Reserve Champion. 2008 Santan Barbara 3 Gaited Show Pleasure Jr. Ex. Reserve Champion. 2009 Arizona National 3 Gaited Country Jr. Ex. Grand Champion. 2009 Carousel 3 Gaited Country Jr. Ex. Reserve Champion. Attache's Easter Present- 2007 2 Year Old Sweepstakes 5 Gaited Champion. Solid Steel- 1996 Blue Grey Shrine WV LTD Stake Reserve Champion. 2009 Arizona National 3 Gaited Coutry Jr. Ex. Grand Champion. I'm Eventful (AKA April Hill's Eventful)- 1994 Nebraska Charity 3 Gaited Grand Champion. 1994 Tanbark UPHA 3 Gaited Champion.1995 Boone County Fair 3 Gaited Junior Champion. 1995 St. Louis 3 Gaited Junior Champion. 1997 Southeastern 3 Gaited Reserve Grqand Champion and 3 Gaited Open Champion. 1997 KSF Top Three 3 Gaited Over 15,2. 1997 Lexington 3 Gaited Over 15.2 Reserve Champion. 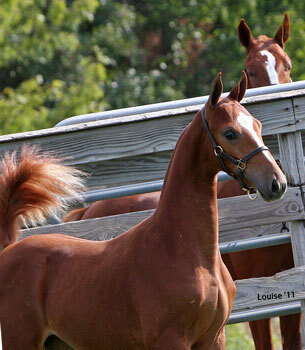 1998 Pro-Am 3 Gaited Grand Champion. 2002 Big D 3 Gaited Open Champion. 2006 Dixie Cup Park Jr. Ex. Reserve Champion. 2010 Dallas Summer Classic 3 Gaited Champion. Grand Marq (AKA Gimme Gimme) (11 SBR Points)- 1997 KSF Top Three 5 Gaited Junior Championship. 1997 Southeastern 5 Gaited Junior Champion. 1998 J D Massey 5 Gaited Grand Champion. 2001 Southeastern 5 Gaited Ladies Champion. 2001 KSF Ribbon Winner. 2004 Big D 5 Gaited Grand Champion. 2005 Eastern States 5 Gaited Grand Champion. 2006 Children's Benefit 5 Gaited Grand Champion. 2006 UPHA Spring Premier 5 Gaited Reserve Grand Champion. 2006 Syracuse 5 Gaited Amateur Reserve Grand Champion. 2006 Eastern States 5 Gaited Amateur Reserve Grand Champion and Amateur Champion. 2007 UPHA Spring Premier 5 Gaited Reserve Champion. A True Gentleman- 1998 Southeastern UPHA 3 Gaited Champion. 1999 Tampa 3 Gaited Junior/Novice Champion. 1999 Gasparilla 3 Gaited Junior Champion. 2007 Blowing Rock Fine Harness Amateur Champion. 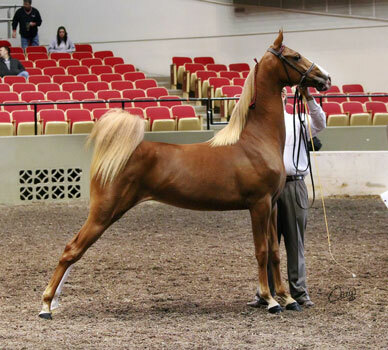 WC Mirror Mirror by WGC Sire Oman's Desdemona Denmark- 1981 KSF WC Junior 5 Gaited Mare. 1981 KSF WCC 5 Gaited Junior Horse. Sultan's Image- 1986 Alamo Charity 3 Gaited Novice Champion. 1993 NC State Championship S&B Shatner Reserve Champion. Cheers Cheers (13 SBR Points)- 1992 St. Louis 5 Gaited Novice Champion. 1995 Missouri State Fair 5 Gaited Amateur Grand Champion. 1999 American Royal 5 Gaited MO/KAN Champion. 2000 UPHA Chapter V 5 Gaited Show Pleasure Champion. 2000 Missouri State Fair 5 Gaited Amateur Grand Champion. Raytown Revelation- 1993 Boone County Fair Open Weanling Champion. 1993 Salina Charity Kansas Futurity Weanling Colt Reserve Champion. Riverside Road- 1994 Boone County Fair Open Weanling Champion. 1994 Missouri Breeder's Challenge Grand Champion. 1994 Salina Charity Kansas Futurity Weanling Grand Champion. 1998 Twin Rivers Park Junior Champion. 2000 J D Massey Country Western Grand Champion. Face In The Mirror- 1997 American Royal Missouri Breeder's Challenge Top Three. Who's The Fheirest- 2003 Des Moines Springfest UPHA 3 Gaited Champion. 2003 Nebraska Charity UPHA 3 Gaited Champion. 2004 Milwaukee Spring 3 Gaited Junior Champion. 2004 ASAW Summerfun 3 Gaited Junior/Novice Champion. 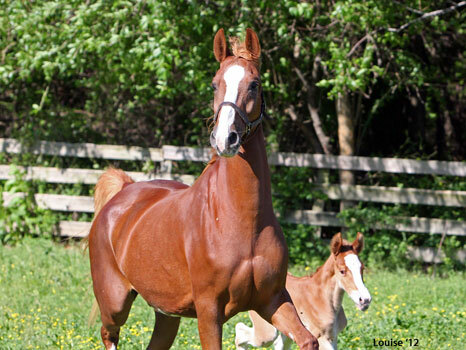 Shamrock's Mad Hatter- 2002 WV Futurity Yearling Reserve Champion. 2008 ASHAO Country Driving Champion and Country In Hand Champion.